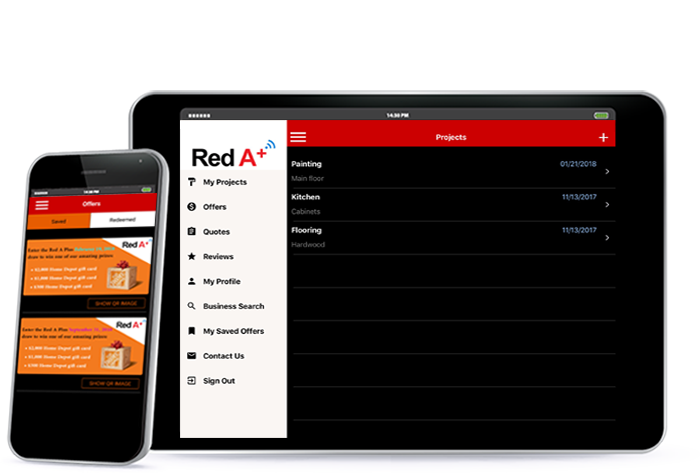 Increase customer options by browsing promotions via web browser and Red A Plus app. Sign up with the Red A Plus home improvement networking app as a consumer and get qualified for a chance to win one of our amazing cash prizes in quarterly draws in 2019! The next draw will take place soon, and prizes include gift cards to your favorite home improvement retailers! including: Creating targeted offers that will be automatically matched to home improvement project profiles, appear in search results for potential customers, and receive reviews from your clients to boost your company’s exposure. Visit RedAPlus.com to learn more! Copyright © 2019 Red A Plus Inc. All rights reserved.